Silver medal winner Brittani Coury of the United States celebrates in the women’s snowboard banked slalom SB-LL2 at the 2018 Winter Paralympics Friday in Jeongseon, South Korea. 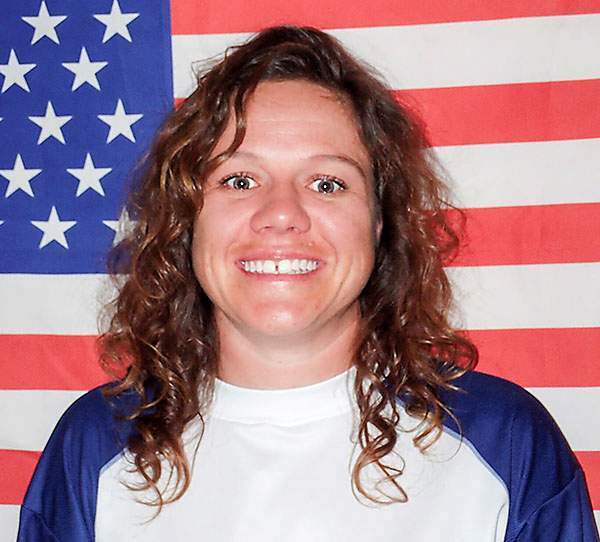 Brittani Coury will bring a medal home to Durango from the 2018 Winter Paralympic Games. Coury, who lives and trains in Durango, captured the silver medal in banked slalom in the lower limb two category Friday at the Jeongseon Alpine Centre in Pyeongchang, South Korea. Bibian Mentel-Spee of the Netherlands won gold with a time of 56.94 seconds. Coury posted a time of 59.87 in her final run to move into second place ahead of Netherlands’ Lisa Bunschoten, who was third in 1:00.04. 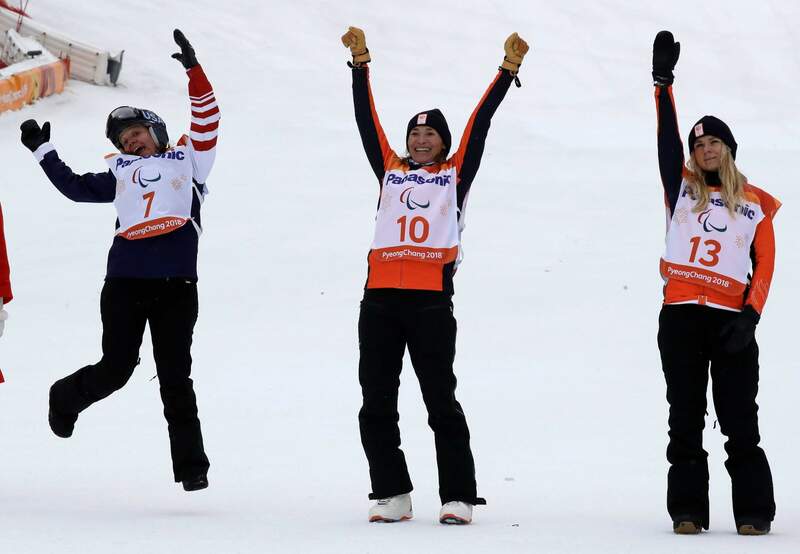 Gold medal winner Bibian Mentel-spee of Netherlands, center, silver medal winner Brittani Coury of the United States, left, and bronze medal winner Lisa Bunschoten of Netherlands, right, celebrate during the victory ceremony for the women’s snowboard banked slalom SB-LL2 at the 2018 Winter Paralympics Friday in Jeongseon, South Korea. “It was incredible, I just let it go full,” Coury said of her silver-winning run in the finals. “I just wanted to be down at the bottom as fast as I could, and it actually paid off. Mentel-Spee won gold in snowboard cross in 2014 and 2018 to go with her banked slalom gold Friday. It is Coury’s first medal of the Paralympics. She competed in snowboard cross earlier this week but missed out on the finals and a chance for the podium with a crash in qualifying. Similar to her first run in snowboard cross, Coury, 31, fell in her first run Friday, but she shook off the spill. Coury, originally from Aztec, suffered a broken ankle after a snowboarding crash when she was 17. After nine surgeries to attempt to repair the broken bone and several years of living in pain, Coury had her leg amputated below her right knee in 2011. 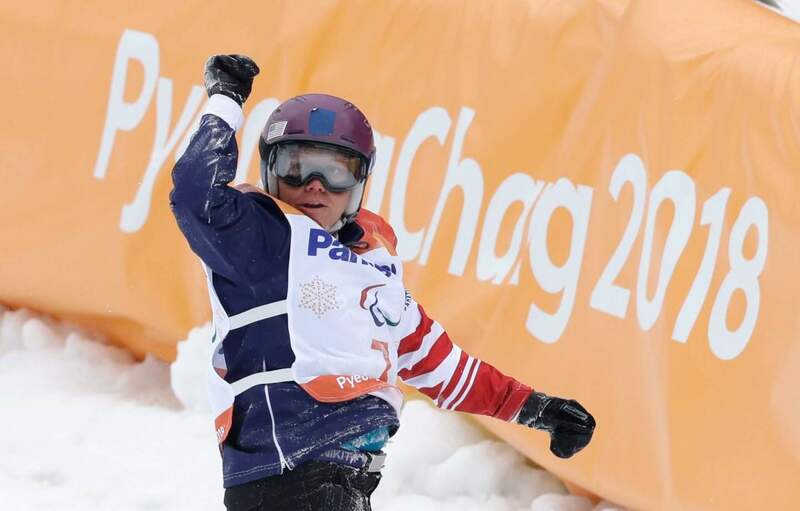 She began snowboarding competitively in December 2016 and earned a spot on Team USA in the summer of 2017 before she qualified for the 2018 Paralympics.